Back in April, I decided to step out of my comfort zone and buy Desert Essence Italian Red Grape Conditioner. 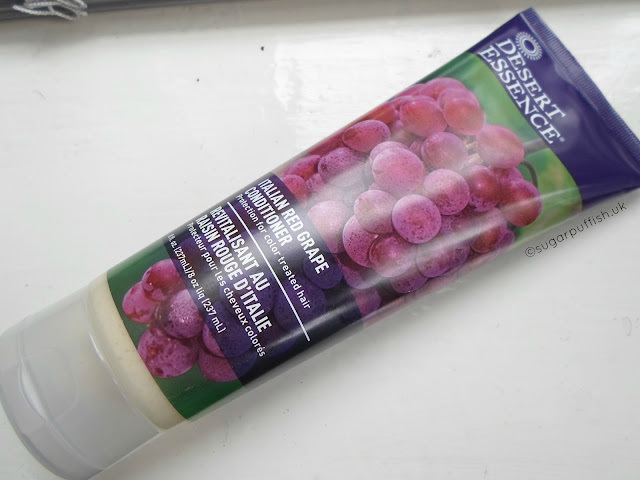 For those of you who are not regular readers, I should explain that Desert Essence Red Raspberry Conditioner has been my holy grail (link to my haircare routine review). I haven’t switched out this product for quite some time, in fact looking back through my blog I estimate since 2013! The blurb for the Desert Essence Red Grape is it protects from environmental damage making it ideal for colour treated hair (which I have). The scent reminds me of grape bubblegum but thankfully it does not last, or at least I do not notice it after my hair is dried and styled. I am sure most of you will be interested in a comparison between the Red Grape and Red Raspberry conditioners. I have to be honest the raspberry still remains my holy grail. When applying to wet hair, the Grape does not detangle as well and doesn’t give the same silky feeling. After styling, my hair does feel nice and soft but on the second day I occasionally feel my hair has lost it bounce. I noticed my Odylique Gentle Herb Shampoo does not seem to be working as well, for whatever reason it seems to have lost lather and I’m wondering if the conditioner is to blame. Perhaps the conditioner is leaving a residue or just changing my hair in some way. This is simply based off the way my hair feels during washing and may be just in my mind, who knows if there is any scientific reasoning behind it. It’s difficult to say how this conditioner affects my colour but in my eyes I see a slight difference. My “Hazelnut Blonde” appears less brassy in certain lights. However, people do always comment on my hair colour when using the Red Raspberry. Overall, I guess I am sitting on the fence with this one. It's not that I dislike the Desert Essence Italian Red Grape but there is just something about the Red Raspberry that pips it to holy grail status. Have you tried Desert Essence** haircare? Which range is your favourite and why? I wonder if they sell this in Holland and Barrett? I'm at a bit of loss for shampoo and conditioner for my bright red hair that isn't by LUSH and a bit beyond my price range. Your hair colour sounds really flattering by the way.